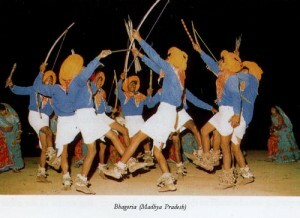 Bhagoria is another festival where young boys and girls choose their partners for life. The Bhils living in Jhabua, Alirajpur and Dhar range of Madhya Pradesh, have four main ethnic groups : Bhil, Bhilala, Patalia and Ranth. Bhagoria dance is performed by all these groups. Before Holi in the lunar month of Phalgun, corresponding to February/March, Bhagoria fair and Haats (occasional market) are organized. Most probably it originated as a fertility ritual and later festivity became more important than the ritual. On the day the fair begins, the dancers gather round a pole fixed vertically on the ground. The headman of the village worships Mandar, a drum with two faces. He then strikes the drum. Immediately the drummers start playing. Both men and women participate in the dance. The male dancers hold bows. The dance is accompanied with the percussion music of one or more Mandars only. The Chhapeli dance prevalent in the Kumaon region of Uttar Pradesh is a social dance which is playful as well as amorous. Several duet dances are performed by couples who may be husband and wife or lovers. Each of the female dancers holds a mirror and a handkerchief. The musicians stand in a semicircle and the pairs of dancers dance before them. The vocalists sing in a chorus and the dancers dance to their singing. The percussion instruments that accompany the singing are: Hurka, an hourglass shaped drum, and Manjira, the cymbals.